It's five wins in eight games now as Hassocks' resurgence after a difficult start to the 2018-19 season shows no signs of abating. Eastbourne United Association were the Robins latest conquest at a wet Beacon as goals from Matt Berridge, Liam Benson and Spencer Slaughter gave them a first home league victory of the campaign against one of the sides they spent last season fighting to avoid relegation against. United came out on top in that battle, finishing six points and two places better off than Hassocks after a dazzling run over the last three months. It's been a difficult summer at the Oval however. While the Robins strengthened their squad with some impressive additions, United saw manager Tobi Hutchinson resign and their young side had picked up only one point from an opening day draw at Arundel before they arrived in Mid Sussex. Hassocks made four changes from the side that rallied from 2-0 down to take a point at East Preston in their last outing 11 days previously. 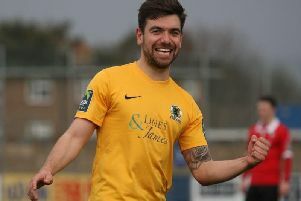 Two-goal super sub Dan Stokes came into the starting line up in place of Alex Spinks, Joe Bull was given a rare start in the absence of James Littlejohn, Jordan Badger replaced the injured Will Broomfield and Alex Harris returned in goal after suspension in place of Josh Green who was working. It was a good afternoon for Stokes and Harris in particular. Stokes put in another dazzling showing that on another day might have earned him the man-of-the-match award had his midfield partner Spencer Slaughter not had his best game in a Hassocks shirt since returning from travelling in January 2017. Harris meanwhile recorded his first clean sheet for over a year although he was rarely troubled in truth, the back four of Harvey Blake, Harry Mills, Dan Jacques and Badger repelling what United managed to throw at them. Berridge opened the scoring with 26 minutes on the clock with his first goal for the club. Some neat passing football through the middle saw the young midfielder end up with the ball at his feet and although his initial effort was blocked, he struck the rebound with a crisp half volley into the bottom corner. That was a just reward for some promising showings since his debut last season and Berridge has rightly become one of the first names on Mark Dalgleish's team sheet this time around. "A great feeling to score my first senior goal and reward us for our bright start," was how Berridge described it and you suspect it will be the first of many in a Robins shirt. Benson added the second with an hour played, making a perfectly timed run off the back of the United left back to latch onto a brilliantly weighted through ball from Phil Johnson that split said left back and central defender. The United defence appealed in vein for off side but no flag was forthcoming. Benson still had plenty to do but he do it he did, keeping a cool head to round the goalkeeper and roll into the empty net. Hassocks threw on teenage trio Ben O'Leary, Jake Lindsey and George Galbraith-Gibbons after that with Slaughter scoring the goal that his performance thoroughly deserved with 90 minutes on the clock. Slaughter started the move, winning possession back in midfield for what felt like the thousandth time of the game before finding Stokes out wide. Stokes' resulting cross was a pinpoint one to Benson who held off the defender at the front post and laid back to Slaughter, continuing his run and on hand to slot home with his weaker left foot. That rounded off a virtuoso showing from Slaughter and it wouldn't be a surprise to hear that he picked up a finger injury at some point throughout the 90 minutes given how many strings he pulled. Slaughter was keen to share the credit with his team mates, praising a "brilliant team performance" after. Tougher tests lie in wait, but for now the Robins are flying. Hassocks: Harris; Blake, Mills, Jacques, Badger; Berridge, Slaughter, Stokes; Bull, Johnson, Benson. Subs: O'Leary (Jacques), Lindsey (Bull), Galbraith-Gibbons (Johnson).